A large upper trough moving south across W Europe transforms into a powerful upper low over SW Europe. 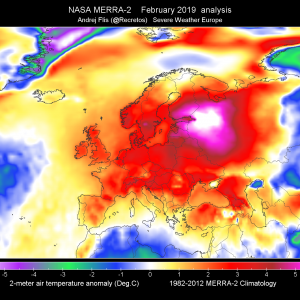 The ridge over Russia slowly extends towards Europe where a stalled frontal boundary serves for another day of severe storms across NE Europe and NW Russia. 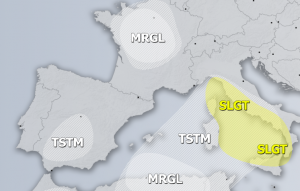 A MDT risk has been issued for western France with threat for large hail, severe winds, heavy excessive rain and tornadoes. Around 700-1000 J/kg of MLCAPE overlaps with strong 30-50kt shear will support severe storms starting in the afternoon and spread northwards. Clusters are possible, bringing severe wind threat in the evening. 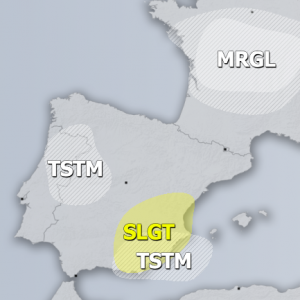 A SLGT risk has been issued for surrounding the MDT risk area over France, Benelux, UK, Ireland and NE Iberia with threat for severe winds, heavy rain, marginally large hail and some tornado threat. 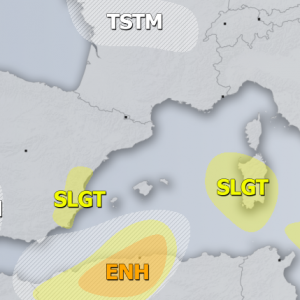 A SLGT risk has been issued for W Iberia with threat for heavy rain and severe winds as a short wave pushes in from the west late Tuesday. A MDT risk has been issued for N Belarus, Baltic States into NW Russia and extreme SE Finland with threat for very large hail, severe winds, heavy rain and some tornado threat. A SLGT risks have been issued for E Europe into NW Russia and parts of SW Russia where threat for isolated severe storms bringing large hail, severe winds and heavy rain exists. 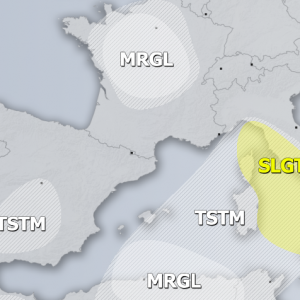 A SLGT risk has been issued for N Algeria into N Tunisia with threat for isolated severe storms under short wave trough crossing the area. Large hail, severe winds and torrential rain are the main threats.